Since moving to West Dorset this Frenchie hears “Oyez! Oyez! Oyez!” at many local events of note (and I must say I couldn’t believe my ears that you should use old French, again). I assumed that town criers had just never disappeared in England. A bit of research when I posted my photo of David Craner, our local loud voice, proved I was wrong. The first thing I came across on the net was the ahgtc (Ancient and Honourable Guild of Town criers). They have a website where I was hoping to find out how many town criers there are and a bit of history. ‘Latest news’ section was not quite what I had in mind. The fact that town criers can rent their loud services to private firms to advertise their wares or events in a theatrical way was not spelt out anywhere that I could find. I suppose the Guild is there mainly for their members so to honour their lost friends is fair enough, even admirable. The poem that accompanies the obituaries is very touching. The Guild also claims to help with the marketing of Town Criers but I must say that they do not seem to be doing this in a traditional 21st century way. Then again, what did I expect? 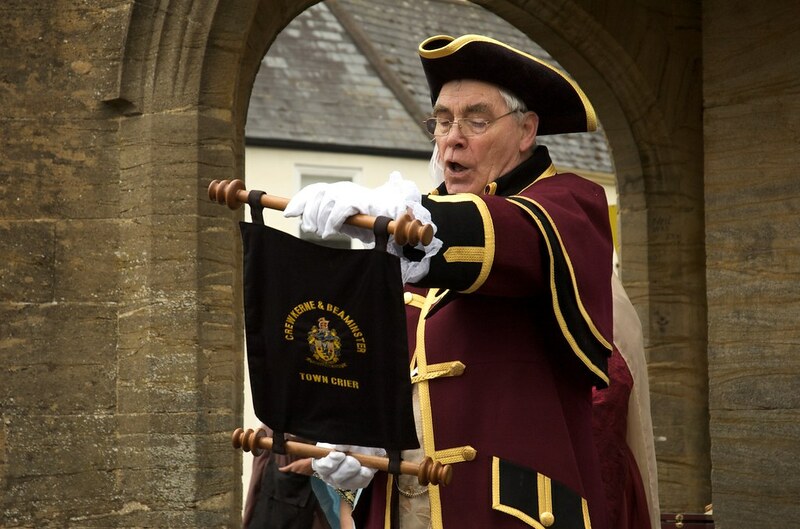 In fact, the most informative website I could find is our own David Craner (for Crewkerne and Beaminster) the first town crier I ever came across. There are 220 town criers in Britain mainly representing towns and cities (although sometimes Lords of the Manor as well). When I last spoke to David he explained that he hoped to go to France to promote the art of ‘crieur public’. I understand he has been approved by the twinning associations so he is a step closer to getting there. Town criers may have spread William the Conqueror’s laws and news after 1066, they have pretty much disappeared in France. There is a small revival but they are mainly volunteers in city centres, spreading private love messages, recipes (this is France!) and community events that locals ‘post’ in their box or cage, found in the local convenience store or café. Some have links to tourist offices but unlike in this country, they are not linked to civil events and Councils. It is interesting that daily newspapers (and literacy) should have been the reason for the disappearance of town criers. A revival in town criers cannot be linked to the drop in sales of newspapers but nonetheless, I can’t help but smile at old fashioned ways coming back to entertain us and local papers struggling to find ways to inform us. I wonder, should newspapers employ town criers to read excerpts of their news and entice people to buy the papers?